Hello everybody, or those that are still reading this blog! After a relatively long absence in which life got in the way of doing the things I love, I'm back with a report on all things Beatle. In March 2014 we visited my home country of the United Kingdom and spent a couple of days in the capital of England, London. To further their successful career, the Beatles knew it was inevitable that they couldn't remain in their hometown of Liverpool in the north west of England. They would have to move to London. 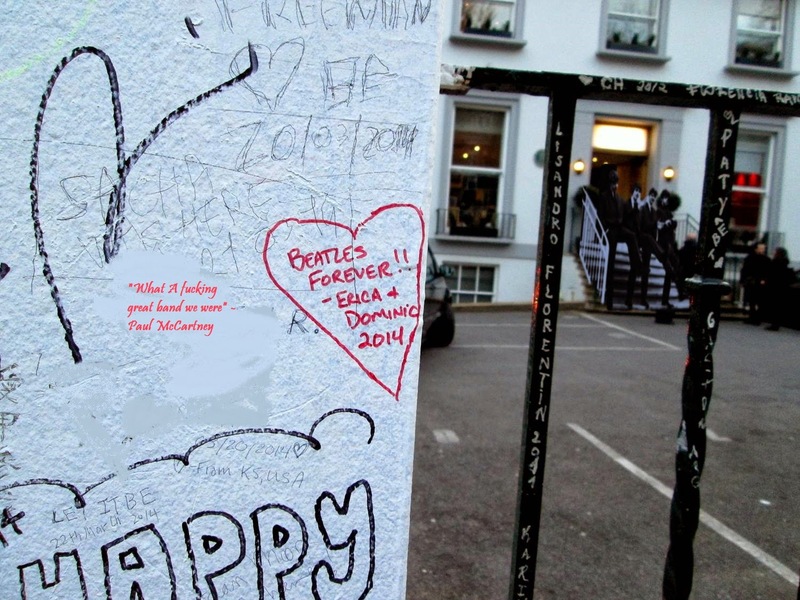 London is where Abbey Road studios is located and as many Beatles fans know, this is where they recorded most of their output between 1962 and 1969. 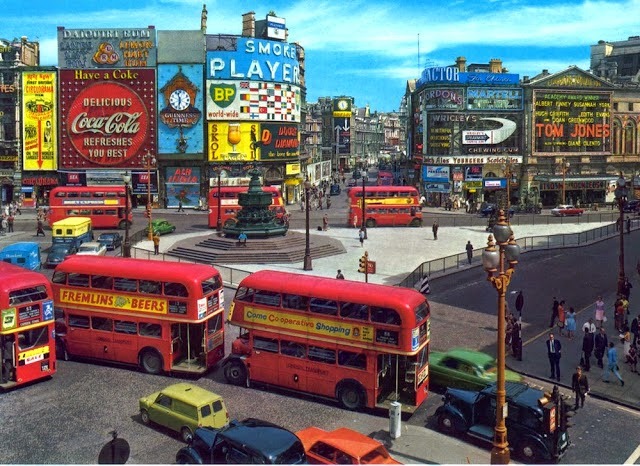 Getting into the swing of things: Piccadilly Circus in 1963. the year the Beatles moved to London. When the Beatles finally moved down to London in the summer of 1963, they were staying at the President Hotel on Russell Square. It soon became apparent to Brian Epstein that they were in London more than they were anywhere else and more suitable accommodation needed to be found. After much searching, Epstein settled on a 4th floor flat (apartment) at 57 Green Street in Mayfair. This was the only time the Beatles ever lived together as a group in London and it was an extremely brief time in the Autumn of 1963. John and Paul were the first to move out in late 1963, John moved because Cynthia and baby Julian had moved down to London and they needed to all live together so they found a place at 13 Emperor's Gate, Brompton. John, Cynthia and Julian moved into the third floor flat secured for them by photographer Robert Freeman, who lived in the flat below them. The name on the doorbell was 'Hadley' to avoid the fans finding out where they lived but by July 1964, the fans had found out that 'Hadley' was really 'Lennon' and so the Lennon's moved out of Emperor's Gate (with a little help from Paul) to 'Kenwood' which is outside of London in Weybridge, Surrey. Paul moved out in late 1963 when he started dating the actress Jane Asher, moving into the top floor of 57 Wimpole street, Marylebone, where Jane lived with her parents and brother Peter. Paul has gone on record many times saying he hated the flat in Green Street and the fact that he had the back bedroom so when Jane invited him to live with her he jumped at the chance. Paul moved out of Wimpole Street in 1966 when he bought 7 Cavendish Avenue, St. John's Wood, which he still owns today. With John and Paul gone, George and Ringo lived at 57 Green Street for only a short time before moving into an apartment at Whaddon House, William Mews, located not far from Harrods in Knightsbridge. Brian Epstein also lived here. George and Ringo lived here for over a year before finally buying homes in the "Stockbroker belt" in Surrey, the same as John had done. Before Ringo moved to Surrey, he moved into an apartment in 34 Montagu Square, Marylebone. After moving to Surrey, he retained the lease on the flat and several rock stars and friends were allowed to live in it, most notably Jimi Hendrix in 1966 & 67 and perhaps even more famously, John Lennon and Yoko Ono in 1968. This is the place where Lennon and Ono were busted for drugs by the notorious Detective Sergeant Norman Pilcher. Starr finally sold the lease in 1969 and today there is a blue plaque on the building commemorating Lennon's time in the flat. Of all the Beatles, Paul is the only one to have remained in London during their career, his home in St. John's Wood being only a short 5 minute walk from Abbey Road made this a perfect place for the Beatles to get together before and after a session. Since the Beatles spent the majority of their time in London when they weren't touring, there are so many places they visited/lived in/worked in. The most notable of these are Abbey Road and 3 Savile Row. The latter being Apple Corps' HQ from 1968 to 1975. The basement of the building was converted into a recording studio and this is where the majority of the band's 'Let It Be' album was recorded and indeed much of the second half of the accompanying documentary film. As if that wasn't enough to secure the building in the annals of Rock history the Beatles themselves fully cemented it's legendary status by playing their final, albeit impromptu and unannounced, live concert on the rooftop of the building in January 1969. The Rooftop Concert has been incessantly copied and parodied over the years, notably in an episode of the Simpsons where George Harrison guest starred as himself and wryly comments when he sees Homer's Barbershop Quartet playing on the roof of Mo's Bar "It's been done". The building today is now an estate agents. Abbey Road studios. Thankfully still a working studio. This is where John met Yoko for the first time, Formerly the Indica Gallery. How the Beatles last gig looked to the typical passerby in 1969. Savile Row is also well known worldwide for its tailor shops. There are several other fantastic sights to see in London too and a lot of them have a Beatles connection, no matter how small. One place they will have a lifelong connection to, however is Liverpool, which shall be explored in my next blog, so stay tuned!